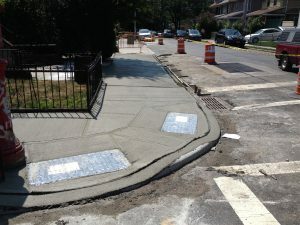 JED Engineering was retained as a member of a Joint Venture to provide resident engineering inspection in connection with the installation of new sidewalks, curbs and pedestrian ramps at designated locations in the boroughs of Brooklyn. Our assignment involved construction inspection for excavation, placement of new sub-base material, placement of 4 inch and 7 inch concrete sidewalks and pedestrian ramps. This contract included approximately 326,000 square feet of sidewalk replacement in different community boards.